San Francisco, California, September 7, 2016 — Brandon Hall Group announced the winners of the coveted Human Capital Management Excellence Awards 2017, and MetaMythic won gold for Best Advance in Compliance Training, continuing placement of MetaMythic in the highest international ranks across all industries, and the top e-learning solution in the utility industry today. 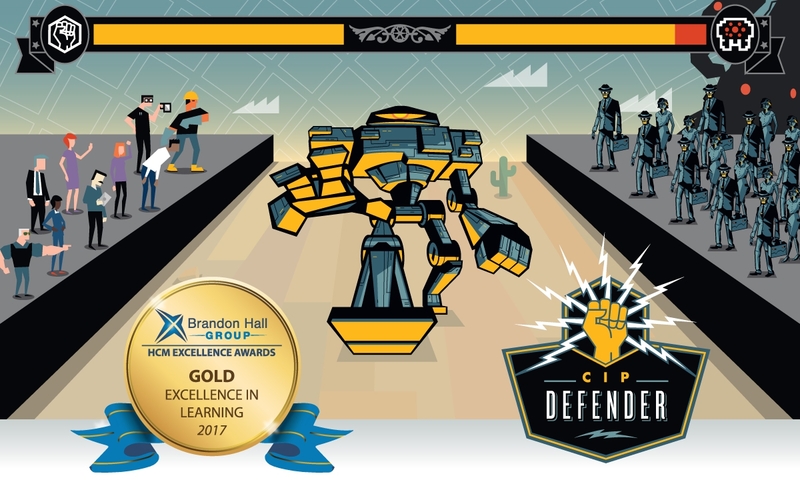 In less than one year since product launch, CIP Defender has won four international awards: Brandon Hall silver and gold in 2016, the International Learning Technologies award in 2016, and now Brandon Hall gold in 2017, demonstrating that MetaMythic is at the forefront of human performance innovation. One year ago, the MetaMythic team transformed employees in organizations across the industry through CIP Defender—a unique story-driven training program that makes each employee the hero of the story by equipping them to defend a simulated facility from cyber-attack. Through this simulation, the employee learns why cyber security is important, practices necessary skills, and takes personal ownership of protecting their company’s infrastructure from the growing array of threats against the North American Bulk Electric System. Today, this latest award recognizes improvements made to the product in 2017 to solve a key problem with annual security training–keeping the story fresh and the learners engaged when they are required by compliance standards to review the same content year after year. Solving these problems led to development of the next episode of CIP Defender: Rematch. Rematch added a new chapter to the learner’s story, additional challenges to overcome, and an innovative new testing system. The results were that learner advocacy rating (a standard measure of engagement) increased from 78% to 82% year-on-year. A panel of veteran, independent senior industry experts and Brandon Hall Group senior analysts and executives evaluated the entries based upon the following criteria: fit the need, design of the program, functionality, innovation, and overall measurable benefits. A full list of winners can be found on the Brandon Hall Group website. For over five years, MetaMythic has helped organizations transform their disengaged employees into cyber-security leaders. MetaMythic is inventor of the celebrated Applied Fiction process for developing the most transformative and impactful training available. MetaMythic first pioneered immersive instructor-led training in the utility industry and then developed CIP Defender, the revolutionary computer-based learning product covering CIP and cyber-security. MetaMythic’s leadership in this space is the most recognized in the utility industry, with workshops and speaking engagements at 2013 SERC Compliance Workshop, 2014 and 2016 SPP RE Conference, NERC GridSecCon 2015, NERC Human Performance Conference 2014, 2015, and 2016, and S4 Conference in 2017. Winner of 2014 PRINT design award, Brandon Hall Gold and Silver awards in 2016, and International Learning Technologies award in 2016. Brandon Hall Group is a HCM research and advisory services firm that provides insights around key performance areas, including learning and development, talent management, leadership development, talent acquisition, and workforce management. With more than 10,000 clients globally and 20 years of delivering world-class research and advisory services, Brandon Hall Group is focused on developing research that drives performance in emerging and large organizations and provides strategic insights for executives and practitioners responsible for growth and business results.